Richard Morris was an inveterate collector of guide books, particularly of places of architectural note. Jenny has so many of them that she is offering them to Members of the Society for free. Tonight you will find another batch. We suggest that you take what you want and perhaps make a donation (monies will be shared between the Harry Sunley Memorial Project and Myton Hospice where both Harry and Richard died). Please – the guides must go! » Last Meeting: Dr Sylvia Pinches gave us an account of Maria Home, housekeeper to the Earls of Warwick, relating the turbulent domestic scene of her time and showing us how she herself came out of very well. It became abundantly clear that she was an astute business woman as well as a consummate housekeeper. The Brooke family owed her a great deal! 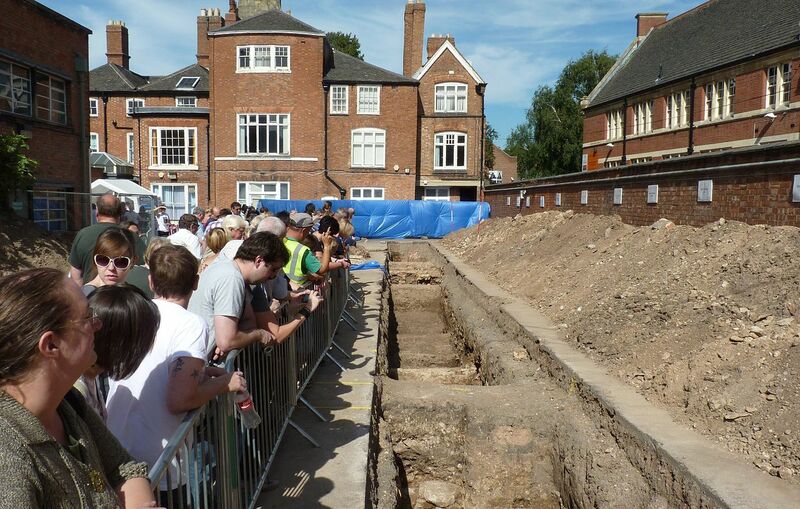 » Tonight: Mathew Morris will speak on “Revealing Greyfriars: The Search for Leicester’s lost Franciscan Friary”. This will be an important follow-up to Dr Richard Buckley’s account of the finding of Richard III’s remains on the site. » Next month: June 12th, Jan Cooper will follow in “The Footsteps of the White Monks” at the usual time of 7.30 for 7.45 at the Senior Citizens’ Club. Dates for your diaries: Our July evening ‘walk about’ will take place on Monday 10th July when we will be looking at points of historic interest in the Bridge Street area. More details nearer the time. Our August outing will take place on Saturday 19th August when we will be visiting three very lovely churches – Halford, Tredington and Honington. Directions – meet at Halford Church for at 11am, bring a picnic or visit Halford Bridge Inn for lunch, followed by visit to Tredington and Honnington Churches during the afternoon. Chairman Jan will talk about both Halford and Honnington Churches and donations at each church would of course be much appreciated. At Tredington we will be given a talk/tour by a member of Friends of Tredington Church and Jan will collect a donation of £2 per person for this church before we arrive at Tredington. Parking at all three locations is very very limited so please get together and car share to keep the number of vehicles to a minimum. If you would like to come along, a ‘signing up’ list is available this evening. Final details and directions will be sent out to everyone participating nearer the date. » Kenilworth Family History Society Wednesday, 10 May 2017 The Society welcomes local professional family history researcher Jacqui Kirk, who will tell the story of one of her own forebears, Thomas Lodge, who was a Mayor of London in Elizabethan times. Senior Citizens’ Club, Abbey End, Kenilworth, from 7.30. Nonmembers welcome. Contact 511969. If any member is involved in research on Kenilworth at the moment, please contact the Chairman or Vice-chairman as there may be a source of help available in making the job easier.